Vigor Events – in co-operation with Al Gas Events – organized the 2nd simulation training within The Knowledge Club™ this year – INTERPLAY™ – in Kuwait. The 2-day Experiential Learning Workshop took place on the 3rd – 4th of December 2018 at the Hilton Resort, Mangaf, Burgan Meeting Room. 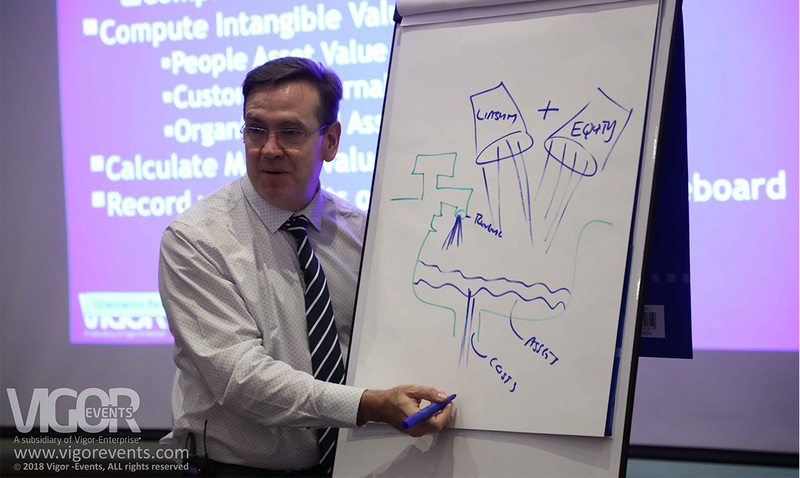 The experiential learning workshop which was presented by JAMES VAN DER WESTHUIZEN, was designed with the objective for participants’ to develop capabilities in those areas crucial to business success decision-making, value creation, resource negotiation, cross-functional collaboration, strategic thinking, and business and financial acumen. It is worth mentioning that JAMES VAN DER WESTHUIZEN is a trusted advisor to many blue chip organizations and leading executives, active since 1998 as the managing member of Know House – a globally respected organizational development and change consultancy active across the African Continent, Asia and the Middle East. He led large scale organizational development and change projects for major public and private sector companies such as: MTN South Africa & MTN Group, Microsoft, PepsiCo, Saudi Basic Industries Corporation, and many others. James is also, one of the most experienced Celemi solution providers with a track record across all products since 1998 and founding member of Sveiby Knowledge associates, African accreditation partner for Celemi of Sweden. The experiential learning workshop as part of the Knowledge Club™ 2018 series, that addresses Leaders involved in the day to day business of strategy execution and decision making. The Knowledge Club™ is the leading & development platform for top organizations in Kuwait, is attended the year by Warba Bank& Burgan Bank as Gold Member, Commercial Bank of Kuwait& Kuwait Oil Company& Hadi Clinic as Corporate Members and with the media support by the International Advertising Association (IIA) – Kuwait Chapter.